Tsuda, K., Abraham-Juarez, M. J., Maeno, A., Dong, Z., Aromdee, D., Meeley, R., Shiroishi, T., Nonomura, K. I. and Hake, S. (2017). KNOTTED1 Cofactors, BLH12 and BLH14, Regulate Internode Patterning and Vein Anastomosis in Maize. Plant Cell 29(5): 1105-1118. Tsuda, K. and Hake, S. (2015). Diverse functions of KNOX transcription factors in the diploid body plan of plants. Curr Opin Plant Biol 27: 91-96. Tsuda, K. and Hake, S. (2015). Homeobox Transcription Factors and the Regulation of Meristem Development and Maintenance. 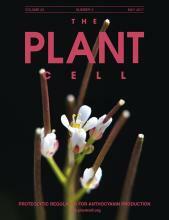 Plant Transcription Factors: Evolutionary, Structural and Functional Aspects 215-228. Tsuda, K., Kurata, N., Ohyanagi, H. and Hake, S. (2014). Genome-wide study of KNOX regulatory network reveals brassinosteroid catabolic genes important for shoot meristem function in rice. Plant Cell 26(9): 3488-3500. Akiba, T., Hibara, K., Kimura, F., Tsuda, K., Shibata, K., Ishibashi, M., Moriya, C., Nakagawa, K., Kurata, N., Itoh, J. and Ito, Y. (2014). Organ fusion and defective shoot development in oni3 mutants of rice. Plant Cell Physiol 55(1): 42-51. Tsuda, K., Akiba, T., Kimura, F., Ishibashi, M., Moriya, C., Nakagawa, K., Kurata, N. and Ito, Y. (2013). ONION2 fatty acid elongase is required for shoot development in rice. Plant Cell Physiol 54(2): 209-217. Tsuda, K., Ito, Y., Sato, Y. and Kurata, N. (2011). Positive autoregulation of a KNOX gene is essential for shoot apical meristem maintenance in rice. Plant Cell 23(12): 4368-4381. Ito, Y., Kimura, F., Hirakata, K., Tsuda, K., Takasugi, T., Eiguchi, M., Nakagawa, K. and Kurata, N. (2011). Fatty acid elongase is required for shoot development in rice. Plant J 66(4): 680-688. Fujita, M., Horiuchi, Y., Ueda, Y., Mizuta, Y., Kubo, T., Yano, K., Yamaki, S., Tsuda, K., Nagata, T., Niihama, M., Kato, H., Kikuchi, S., Hamada, K., Mochizuki, T., Ishimizu, T., Iwai, H., Tsutsumi, N. and Kurata, N. (2010). Rice expression atlas in reproductive development. Plant Cell Physiol 51(12): 2060-2081. Tsuda, K., Ito, Y., Yamaki, S., Miyao, A., Hirochika, H. and Kurata, N. (2009). Isolation and mapping of three rice mutants that showed ectopic expression of KNOX genes in leaves. Plant Science. 177: 131-135.